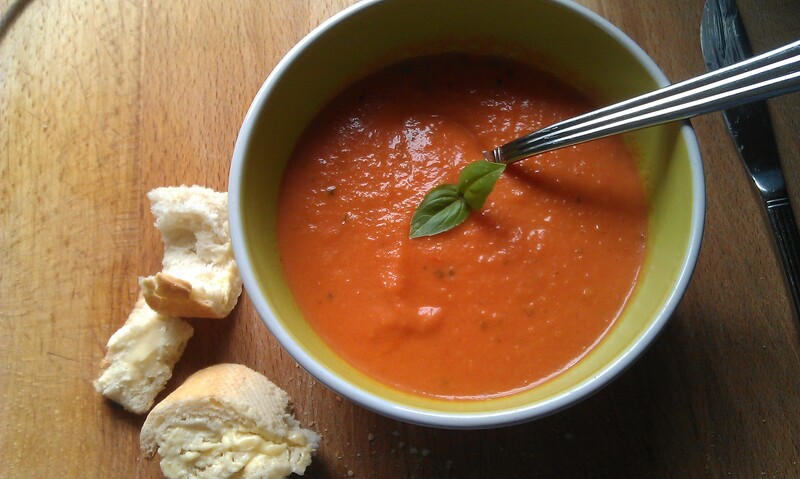 This tomato and basil soup recipe originally comes from The Ballymaloe Cookery School Cookbook. I may not have it word for word as I seem to adapt every recipe I cook! I think they may use fresh tomatoes for their recipe though and as it is only March, we don’t have any growing in our cold little climate yet. But I will soon be planting my tomato seeds and crossing my fingers and toes for a good summer 🙂 When you say a good summer in Ireland, it does not refer to a good time; we are talking about the weather!! Melt the butter in a saucepan, once melted add the flour and mix over a low heat until the flour has cooked out. Add the milk a little at a time whisking constantly. You may feel that you need a little extra milk at this stage if the sauce is too thick – that is ok! Add the thyme, salt and black pepper. Allow to sit on a low heat. This sauce works great with fish too! Fry the onion until soft in a saucepan. Add the tinned tomatoes and sugar and stir. At this stage I just add everything into the saucepan and stir, it couldn’t be more simple. Leave the pot to simmer for 15 – 20 minutes. If you have a stove, this is ideal, otherwise on a really low hob. Do not allow to boil as the tomatoes only like a gentle heat… and this is best eaten hot, not boiling to taste the flavour!